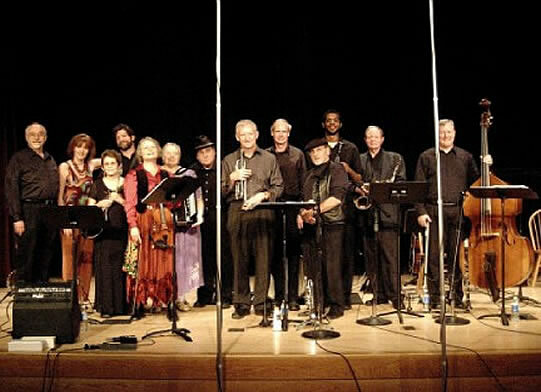 Magnolia's unique sound comes from the mingling of players with different musical backgrounds: Klezmer, Balkan, Jazz, brass band, polka, and classical. The band’s repertoire also includes Yiddish theater tunes and E. European folkdances as well as Klezmer from the old world and new. Now 23 years old, MKB comes in a size to suit all: a 12 -15 piece 'industrial strength' concert band and smaller subgroups, from 4 to 8 suitable for club dates and for weddings, bar-bat mitzvahs, parties, benefits, and other celebrations. MKB has performed at prime regional venues in the Triangle/Triad area of NC including the well known club, Cats Cradle, The Cave, Motorco Music Hall, the Pittsboro General Store, the Duke University Performance series "Jazz on the Patio", the Carrboro Arts Center 30th anniversary and the WorldArts Festival, a Ciompi Quartet concert, Jewish Film Festivals, the Southern Institute for Contemporary Art, the Raleigh International Festival, the opening of the Peoples TV channel, Apple Chill, the Chapel Hill Museum, Weaver St. Market Jazz Brunch, Hillsborough "Last Fridays", Southern Village Green, senior centers and retirement communities, schools and festivals, and at various synagogues in NC for Simchas Tora, Hanukkah and Israeli Independence day. 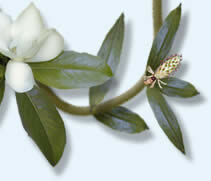 In 2006 a group of Magnolias appeared on NPR's "The State of Things" and in 2007 the entire MKB appeared in a Pinecone "Music of the Carolinas" concert. This was recorded live and a CD, "Trip to Amerika" was released. (Click Listen for info.) In 2010, MKB was invited to again perform at a Pinecone concert to celebrate the permanent exhibit of "Down Home: Jewish Life in NC" at the Raleigh History Museum. 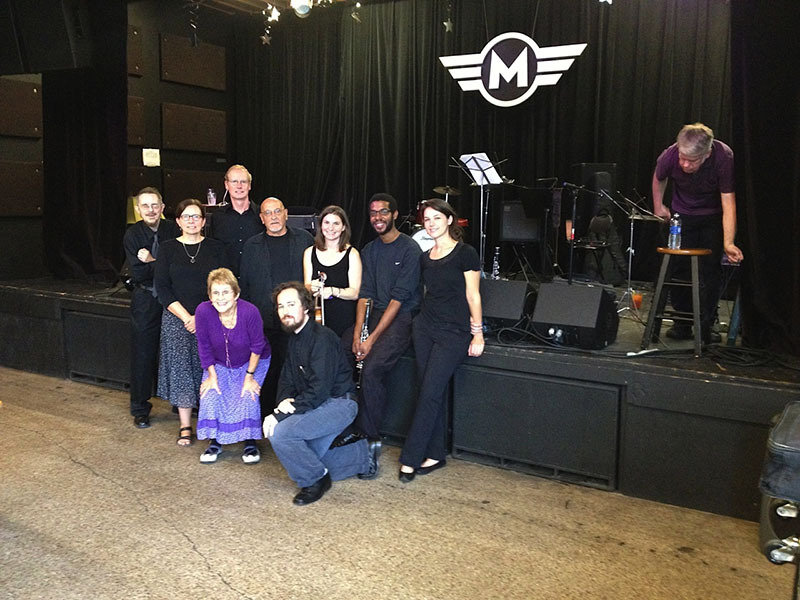 "I have presented The Magnolia Klezmer Band on two occasions as part of an outdoor summer series. They 'packed the house' each time, and had the audience singing along, even getting up to dance. 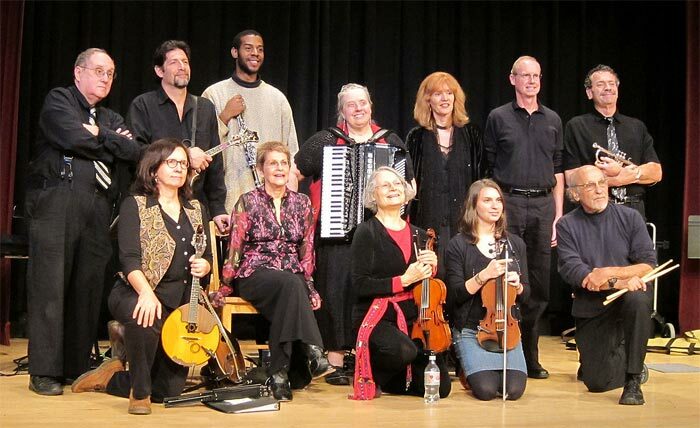 Their performances of klezmer and gypsy music were punctuated with knowledgeable and clever comments about the music and its history, and the repartee between the performers made everyone feel part of the show." "Elliott, Great show! Let's do it again some time. I think everyone enjoyed themselves." "Sandy, congratulations to you and all the Band for that great performance on the lawn in Carrboro! I can't think of another Sunday that I enjoyed as much as this one! My IFD friend Lili and her husband joined me for the occasion, and they too found it really super. People in this area are really lucky that your group is treating us to such great klezmer music. Many thanks!" The blog "Gimme Five" featuring Elliott Mills appeared in the Carrboro Citizen, a local and favorite area newspaper.